This is early morning and work is already underway on the cathedral. If you look closely you can see the morning hose man, washing away the detritus of the night before in front the Cabildo, the Saint's next door neighbor. 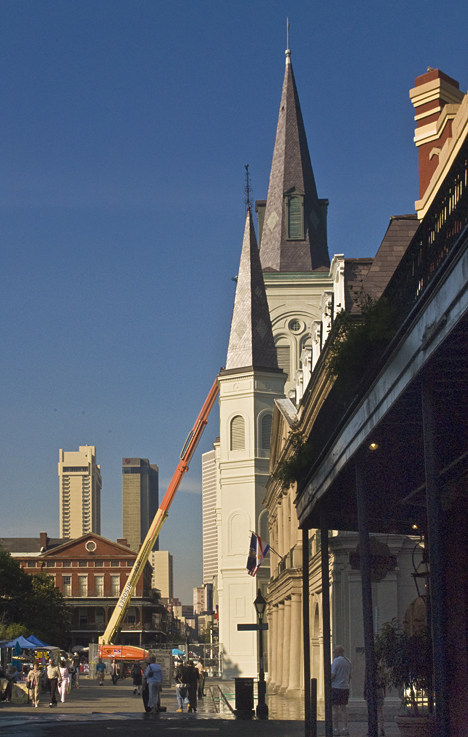 The city is coming to life and soon the Chartres Street will be brimming with performers, artists, and onlookers. 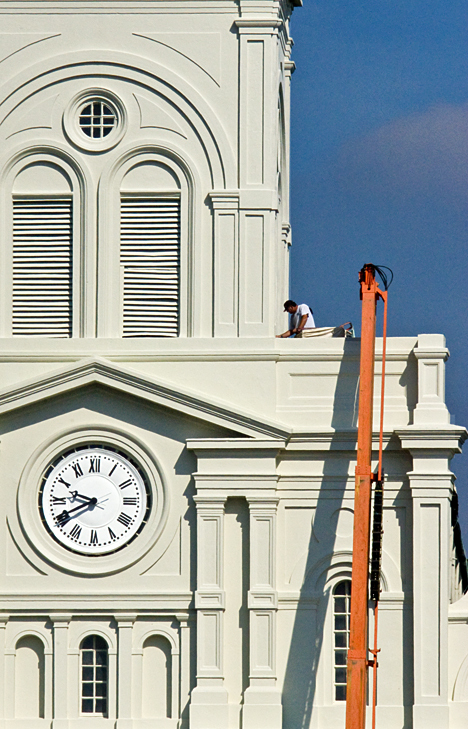 Even Saints need maintenance and New Orleans Saint Louis Cathedral is no exception. Folks in New Orleans have worshiped at a church in this location since 1727. The current structure was completed in 1789 after a fire destroyed the original building in 1788. Since that is two centuries and some change, it is patently obvious that regular, conscientious maintenance for the cathedral is the rule, not the exception. See another view of St. Louis Cathedral in our April 19, 2009 Weekly Grist post. See more of the French Quarter, namely a couple of French Quarter carriage mules on the Photo of the Week page at Corndancer.com. Later, about 20 till 10, this worker plies his trade slightly below the middle steeple and you can admire the meticulous 18th century architectural details. This entrepreneur's sign reads "HAND MADE HEMP JEWELRY By donation. Nomad Fiber Arts. Trades Welcome," in April, 2004. 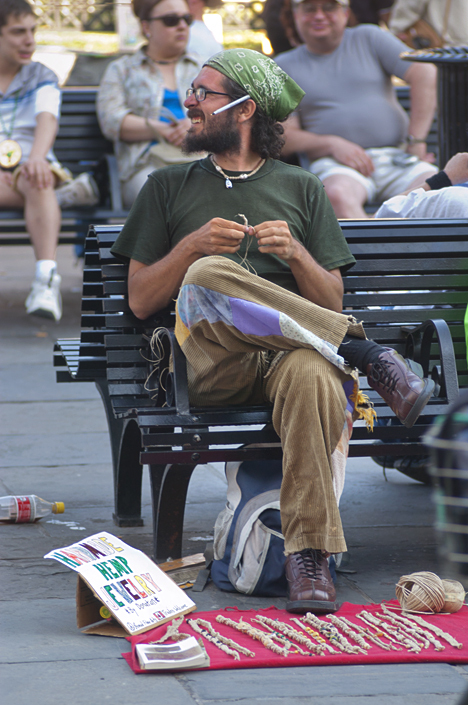 To each his own, I'm still thinking the term "HEMP JEWELRY," does not ring the truth and veracity bell. He's in Jackson Square in New Orleans, so no surprise there. The Saint is behind the square. Sixteen months after I shot these pictures, Katriana struck New Orleans. Fortunately things don’t look much different in this part of New Orleans now. That’s how I began my comments on September 14, 2008. This verbiage came as a result of my hurried trip to the Cossatot River after watching a big storm on radar pelt the area the night before. That meant the river was in its Class V stage, during which only world-class kayakers should venture forth. The shoot was on. Turns out, my friend and superb photographer Chuck Harralson of the Arkansas Parks and Recreation Department had made arrangements for three expert kayakers to negotiate the white water while he, and then, we, shot after we both arrived within minutes of each other. I had no idea he would be there. The kayakers made several trips through and it was a thrill to watch and shoot. See some of the shots and read the original post here. See the start of the story and a full size version of the picture you see above at Corndancer dot-com. Here are links to three galleries of where you can see three world-class kayakers coming through the white water: Tommy Wingard, Jason Mellor, and Sabrina Mellor. 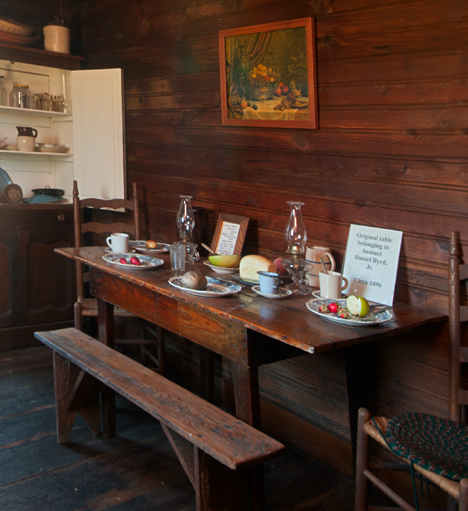 You are looking at a kitchen table which has been in use since 1896 in the Samuel D. Byrd house near Poyen, Arkansas. The rest of the house is similarly furnished with period heirlooms reflecting the history of the home and times of its residents, the Byrd family. It’s not every day that one has the opportunity to visit a residence which originated in 1848. Ever higher on the rare scale is to see such a structure furnished with original heirlooms passed down for several generations, and hear a good history of the place and its residents from an authority on the subject. The place is the Samuel D. Byrd, Sr. house just west of Poyen, Arkansas on U.S. Highway 270. And we are looking inside the old home. Listed on the National Register of Historic places, the old home is still owned and maintained by Hobart “Sonny” Byrd, a descendant of Samuel D. Byrd, and his wife Betty. The Byrds have done an extraordinary job of maintaining and furnishing the home to reflect the residents and their life and times. Before we go much further, may I suggest that you go to the Photo of the Week Page at Corndancer dot-com to see exterior pictures of this historic home and find the beginning of this story. We will wait here for your return. 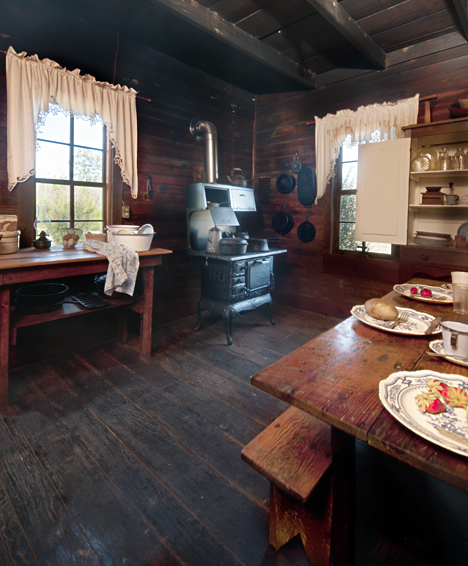 The kitchen is complete with a wood stove and less running water. The dishpan is on the table in front of the window at the center of the picture. Betty and Sonny Byrd furnished and created the historic environment with original family artifacts. See more pictures of the old house in our Weekly Grist Gallery. Like most rural homes of that era, this home, now a nice-sized 6-room dogtrot house, started as one room enclosed by logs. The first order of business was always to get shelter from the elements, critters, and any meandering miscreants who might wander through. One of the first additions was for storage. The north exterior wall of the original structure is now the south exterior wall of the storage room. The Byrds have filled the room with jars, tools, filled burlap bags, and other implements of daily living from days gone by. 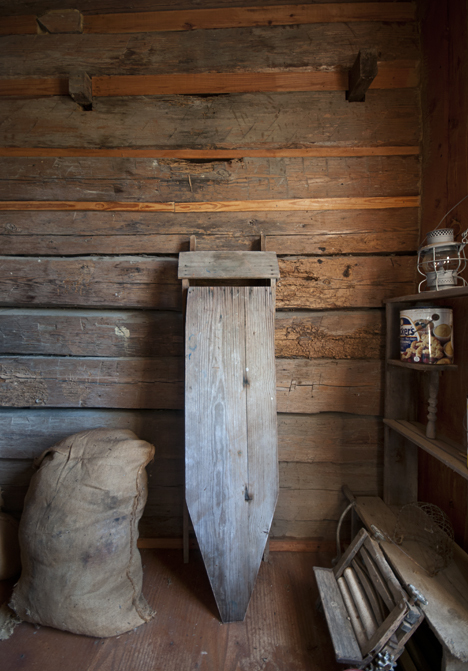 The south wall of the storage room is the north exterior wall of the original log room. A burlap bag, old ironing board, washer wringers, burlap bag, coal-oil lamp, and lard can add authenticity. 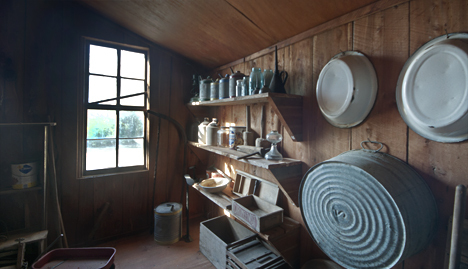 The north storage room wall holds a collection of standard household items of the era: A large washtub, dishpans which double as a bathtub for babies, plus shelves of jars, cans, and boxes. A coal-oil can is under the window. (For the uninitiated, “coal-oil” is the old-timey word for kerosene). The original fireplaces and chimneys for the house were of the mud variety. They were built from available rocks, chinked and covered with mud. 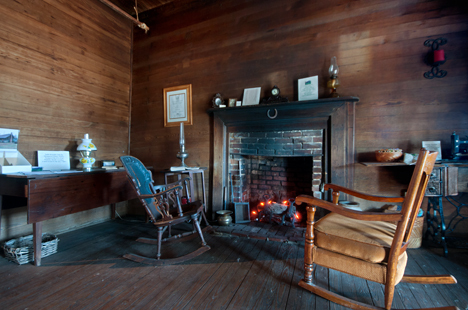 The family replaced the mud fireplaces with the brick fireplaces around 1920. The remaining fireplace is now in the “front” room. The room is large and doubled as a bedroom. The family replaced the original mud fireplace with this brick one around 1920. This is the “front” room, a living room in modern parlance. It doubled as a bedroom. We are grateful to Sonny and Betty Byrd for their good work in preserving this fine historic home. What they are doing is purely voluntary. They do what they do with the old home because they believe it is the right thing to do. Some will say this is a study of a simpler time. I’m betting the folks who lived then did not see running outside to do their business, draw their water, feed livestock and defend them from wild critters, cut trees, chop wood, kill your own meat, build a fire in a kitchen stove, wash dishes in a pan, wash clothes in a tub and keep a wary eye out for bad guys as a simple life. It does not sound simple to me. It sounds busy. But then everything is relative. See a detailed history of the old home and family by Sonny Hobart at Samuel D. Byrd Historic Home. To set up a visit, send an email. SEE MORE PICTURES of the historic house in our Weekly Grist Gallery. See more exterior and exterior pictures of the historic Samuel D. Byrd house in our Weekly Grist Gallery. There are 18 pictures including larger versions of the pictures you see here and on the Corndancer page. See bedrooms, another kitchen shot and more. Click and go. Guaranteed all-natural, low-cholesterol, g-rated, non-fattening content. Full refund if not fully satisfied. Click on the church for the original story. Just now recovering from a bout with an undesirable “upper respiratory infection,” and having absolutely no desire to precipitate a self-destructive relapse, I remained confined to quarters when I would normally venture forth to capture new images and their accompanying stories. Fortunately back in February 2010, I was in well enough and visited the Dixie community in central Arkansas, home to the outstanding St. Boniface Catholic Church, a favored target of most discerning Arkansas photographers. Winter is a good time to shoot the historic structure since there is good light unfettered by a lot of tree foliage. So we are sending you to see that story again. The original story at Corndancer dot-com reveals a lot of details about the church and some additional pictures. The Weekly Grist story for that week shows you the other stuff we usually grab in the neighborhood of a shoot. After the church shot, we wandered around the area recording other images including another old church, a leaning building, and a cool moon shot over Lake Maumelle, Arkansas, where I raced sailboats in a former life. See all of the pictures plus more from the trip in our photo-only Weekly Grist Gallery last March. 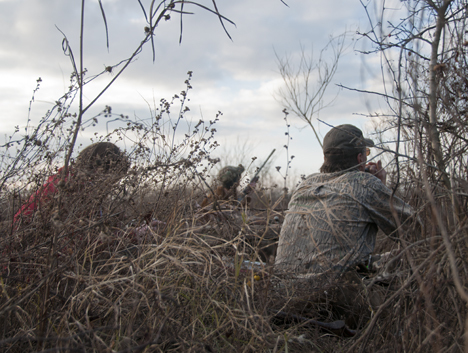 Goose hunter Mike Goodwin, hunkered down in brush, takes a short pause to watch approaching geese he has convinced to come his way. The hunt was west of Humphrey, Arkansas off Arkansas Highway 13 near Crooked Creek. I was unexpectedly invited to be the guest photographer. Click on the old granary for the the start of the story. Garnering an invitation to photograph a Grand Prairie goose hunt was the last thing I expected when I set out to photograph the old granary where Crooked Creek crosses Arkansas Highway 13, west of Humphrey, Arkansas. But then one does not question the favors of fate. Find out how this story started and see pictures of the old granary on the Photo of the Week page at Corndancer dot-com. We’ll wait here. After shooting the old building, I drove to a field full of geese nearby, dismounted, approached them, spooked them to rise, and photographed them. As I left the field, I noticed a truck pulling up at the old granary. Believing I might have a source of information about the building, I approached the driver, explained what I was doing and asked about the old building. He did not reveal a lot about the building, but did invite me to be a part of the goose hunt he was supervising. Without hesitation, I agreed. 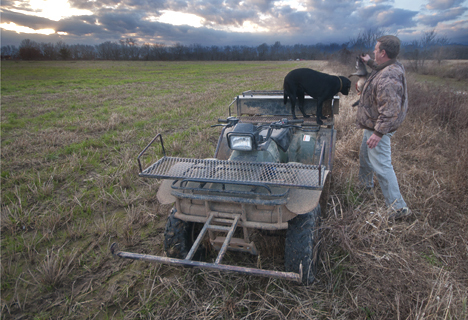 Goose hunter Mike Goodwin and his Labrador Retriever, Star. We joined Mike and Star as they pursued the hunt. They are facing the general direction of approaching geese. To their rear is a field where Mike has placed a dozen or so very realistic goose decoys. 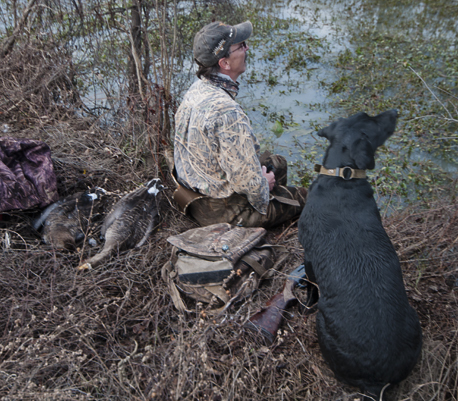 Megan Kerr (center) watches as Mike Goodwin (right) calls geese in. Megan's friend Lee Anne Woodall (left) joined the group. She had no camouflage, so she is doing her best to hide behind the brush. Geese have wary eyes for humans. Mike called in two groups of geese. The first group of geese won and flew on their way. Most of the time the geese win. That’s why there are so many geese. When the second group came in, Megan bagged her first goose. Star, the lab retriever did her duty and brought the felled goose back to Mike. After that, the geese began to make their way back to their roosting areas for the night. They have an early bed time. Steve who invited me to the hunt, loads geese onto the four wheeler which will carry us back to our trucks, which are specks on the horizon. As afternoon turns to early evening, geese head for their roosting areas for the night, well out of the range of hunters. Smart birds. 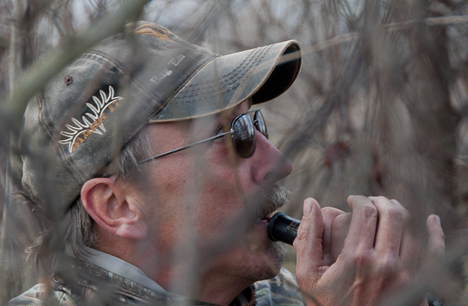 We were privileged to be the guests in the practice of a time-honored outdoor sport in which hunters ply their learned skills against wary natural instincts eons in the making. Most of the time the instincts win. That’s the sport. 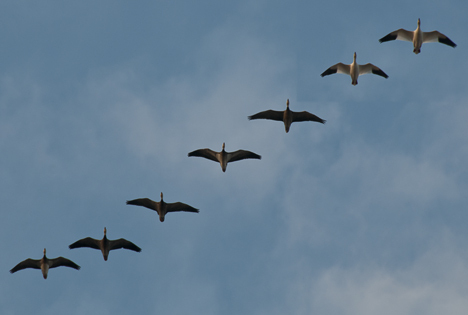 We’ve posted 29 pictures of the hunt and granary in our Weekly Grist Gallery including Star retrieving the goose, the four wheeler ride, calling geese, geese in formation flight, and geese on the water. It gives us goose-bumps just to think about it. The pictures are larger and easier to see than the pictures on this page. Click and look.